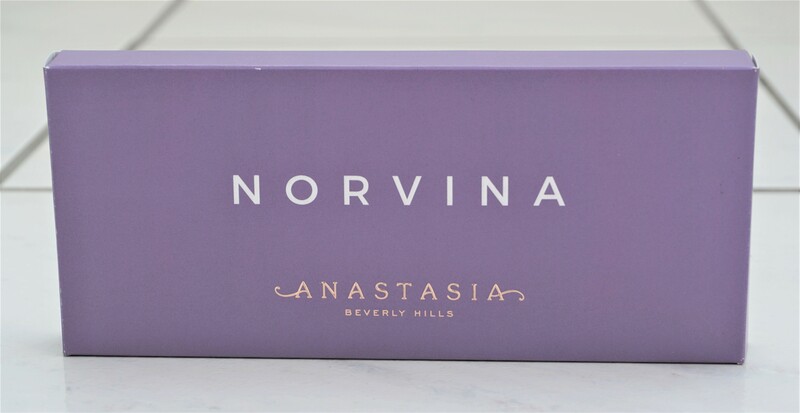 The Norvina Palette comes packaged in a sleek, rectangular lavender purple box. The front of the box has the palette name – Norvina – in white and the brand name in gold lettering. The box states that each eyeshadow has a net weight of 0.71g/0.02oz. The ingredients list and distribution information are also printed on the box. The box says that the palette is “Norvina’s go to eyeshadow palette featuring fourteen whimsical shades ranging from bold and bright mattes to soft pastel shimmers”. The Norvina Palette comes in a sleek, rectangular rectangular purple packaging, with a soft, velvet like finish. The front of the palette mimics the outer packaging, with ‘Norvina’ printed in white lettering and the brand name in gold. 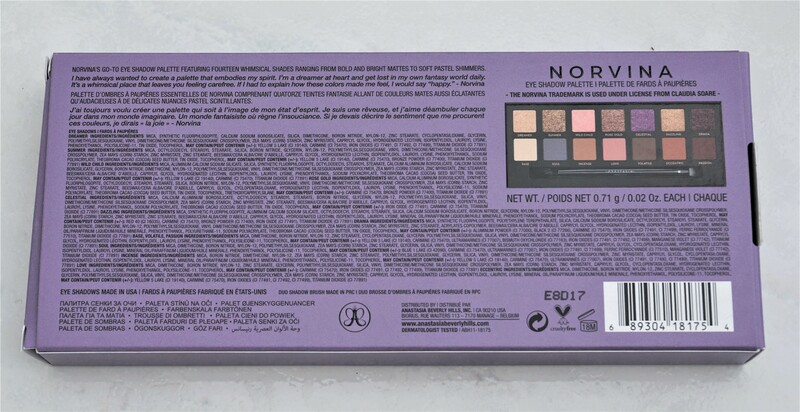 The back of the palette has a sticker providing the distribution information, brand website, where the palette and brush are made (USA and PRC, respectively) and the product weight. The palette feels really lovely and luxurious in the hands due to the velvet style material. I’ve seen some reviews where people say that the palette can get marked with eyeshadow due to the velvet-like finish. I don’t really mind if that happens but it’s worth noting, particularly if you like your palettes to look pristine and to wipe clean easily. The palette opens to show a mirror on the inside of the top lid and the eyeshadows in the bottom section. The mirror is a reasonable size and handy if you don’t have a mirror to hand. 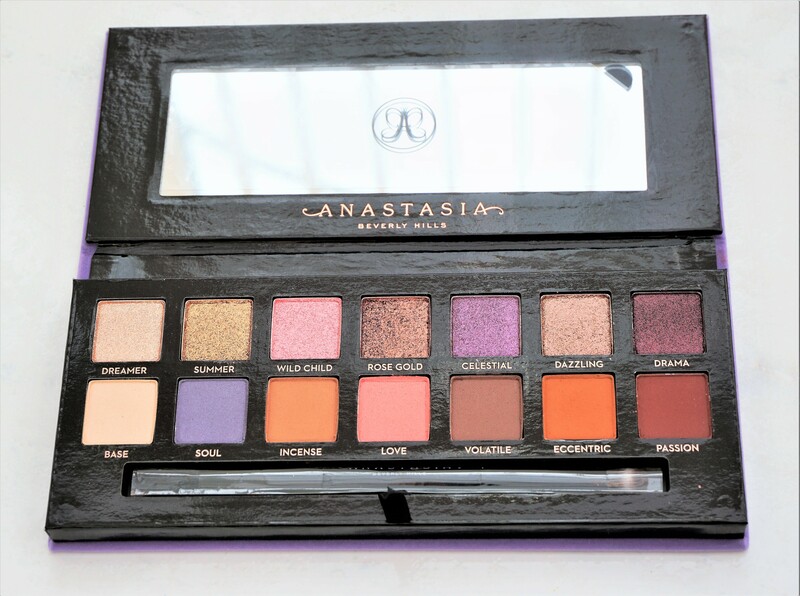 The palette contains 14 eyeshadows, with the names printed underneath each eyeshadow. The top row contains the shimmer eyeshadows and the bottom row has all matte eyeshadows. Whilst I do prefer to use my usual brushes for make-up application, both ends of the brush seem really good. I think it is really handy having the brush in the palette, particularly if you are travelling or you don’t want to have to invest in various eyeshadow brushes. There is a handy little ribbon tab in the brush section which you lay the brush on, enabling you to easily pop the brush out of the palette. The tab is a really good feature, as it can sometimes be tricky to get brushes out of palettes from the little indented sections! The palette contains a really good selection of shades ranging from beautiful purples, browns, rose golds, champagnes, pinks, coppers and deep plums. The purples and pinks really stood out to me at first but having played with the palette, I just love the other colours too! The spectrum of colours provided in the palette enables you to create lots of different types of looks and experiment with different colour combinations. You can use the purple and pink shades to add colourful pops to neutral looks or focus more on them to create colourful combinations. I love the addition of Drama, a deep metallic chocolately-plum shade, as you can use it to add extra smokiness to looks, or on the lid for extra ‘drama’ on the eyes. There is a mix of finishes, with a choice of seven shimmer and seven mattes, enabling you to use the eyeshadows in all sorts of ways. The different finishes enable you to add real depth to the eyes for a more complex look, or simply add a pretty wash of colour to the lids. The various matte browns (Incense, Volatile, Passion) act as great transition, crease and lid colours, whilst matte shades like Soul and Love are really interesting in the crease, on the lid or as liners along the lashlines. The shimmery shades are beautiful for single eyeshadow looks or to emphasise the lid when using mattes in the crease. The range of eyeshadow tones (light, medium, dark) adds to the versatility of this palette, as it enables you to add dimension to the eyes or to focus on simple combinations. You can achieve very soft and natural looks using the lighter tones, whilst smokier, bolder looks are possible by experimenting with the deeper tones. The eyeshadows in the palette are beautifully pigmented, buttery soft and a dream to blend. The shimmery eyeshadows (top row) really come alive when they are packed on the lid, so I would highly recommend using a flat shader brush for application. I have also experimented with using my finger to pack them on the lid and that works very well too. I think spritzing a brush with a fixing spray or water would also work well at bringing the shimmer out even more. One thing worth mentioning is that the eyeshadows are very soft in texture; they are a lot softer than other eyeshadows I have used before. You only need to very lightly ‘tap’ your brush into the eyeshadow to pick up some powder. If you press your brush firmly to pick up the shimmer eyeshadows, it can create a ‘dip’ in the eyeshadow pan and kick up too much powder. The matte shades can also kick up quite a bit of extra powder when you dip your brush in to them, even with light pressure. I think the soft texture helps make the powders extremely blendable and easy to use. However, it means that you do need to be careful about not applying too much pressure when you use your brush and to tap off any excess powder before application to prevent excessive fallout on your face. The Anastasia Beverly Hills Norvina Palette costs £43 and is available in the UK from Beauty Bay, Feel Unique, Cult Beauty and Anastasia Beverley Hills. Do you have the Norvina Palette? What do you think of it? Any shades that are your favourites or any combinations that you love? Let me know in the comments section below. Those colors are gorgeous! Need to get my hands on this palette! Yes, it’s such a beautiful palette! I’m so glad that I picked it up. Let me know if you end up getting it!